For years indoor navigation has been a market niche with only a dozen powerful providers including MapsPeople. But now indoor wayfinding is finally moving out of its infancy. It’s gaining currency, the market is growing rapidly, and the competition is increasing. At MapsPeople we want to stay in the lead and define the future of indoor wayfinding. This requires hard work to constantly improve all aspects of our indoor navigation platform, MapsIndoors, and to develop new features. Here are some of the ways we made MapsIndoors even better in 2018. #1 Virtual Stadium API: We’ve been working with stadiums since we started doing indoor navigation and last year we developed a very cool solution with one of our skilled partners: VISTA, a virtual stadium solution that allows users to virtually visit a sports arena. But why would anyone want to visit a stadium virtually? The solution is intended for sports associations hosting championships and tournaments around the world. As visiting stadiums is often part of the preparation for sports events, preparation can get rather time consuming, expensive, and also bad for the environment if it includes flights. With VISTA sports associations can now virtually visit stadiums to get the on-site felling in a more eco-friendly and cost efficient way. #2 Network manager: Indoor navigation is a valuable tool in large buildings but what do you do if a part of the building is closed due to reconstruction or if the shortest route suddenly isn’t the fastest one? In 2018 we launched the network manager that lets backend users interact with the navigation network and force MapsIndoors to navigate people a certain way. This makes it possible for backend users to lock part of the map so this segment gets temporarily deactivated. 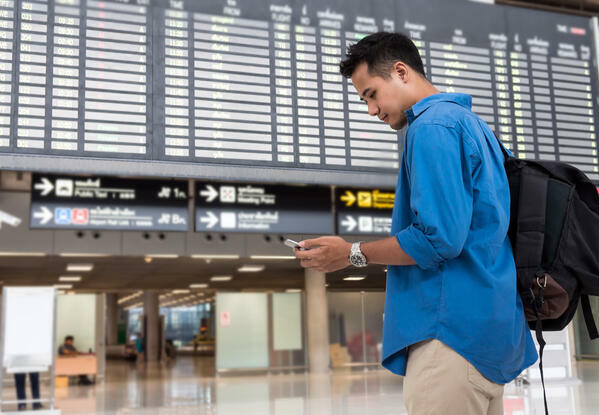 The network manager also allows venues to set waiting time on navigation steps meaning that, for instance, airports can integrate the MapsIndoors platform with a queue management system tracking waiting times at security. If the waiting time is longer than the set limit, MapsIndoors will automatically guide people along the fastest route rather than the shortest. #3 Offline navigation: In today’s digital world people increasingly expect to be able to use technology for every aspect of their lives and younger generations even consider digital connectivity as important as any other basic human need, such as food and shelter. At MapsPeople we want to make sure that people can always use our platform even in buildings with poor internet coverage so when we developed our MapsIndoors SDK 2.0, we put a lot of effort in making the core features work offline. This means that despite poor internet connection, you can ship your app with all the content and data needed to create wayfinding and your users won’t have to worry about registering to a hot spot or keep retrying with a dreadful 2- or 3G connection. The offline features are only available in our native SDK’s for iOS and Android. #4 WCAG 2.0 AA compliant for iOS: While this update only changed the look of our iOS solution, we’re very proud that MapsIndoors for iOS is now WCAG 2.0 AA compliant. WCAG stands for Web Content Accessibility Guidelines and they’re a set of recommendations for making web content more accessible. We want to make sure that MapsIndoors is easy to use for everyone and that’s why we’ve updated the iOS version so it meets the needs of people with impaired vision. It’s always been possible to choose between different color schemes in MapsIndoors but now the text in the map also changes with the iOS settings. So, if the user changes the text size in the iOS settings, the text in MapsIndoors changes too. #5 Public Data API: At MapsPeople we’re proud to work with very large companies around the world. Companies that already have their own developers and their own content management system that they prefer to use. That’s why we spend the first half of 2018 developing a public data API that allows our customers to access their map and make changes through their own content management system. The Public Data API lets other systems interact with the MapsIndoors CMS so companies can use their own CMS to make changes in their MapsIndoors solution. The API also lets them draw data from the other systems they’re using, such as waiting times from a queue management systems. If you want get up-to-date news about MapsIndoors updates and releases, go to our blog and sign up for our monthly newsletter.